The breakdown of plumbing systems cause water leaks for many reasons. 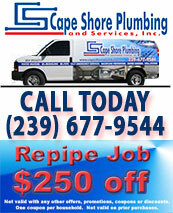 A drain pipe leak or other water leaks may arise because the pipe’s lifespan has expired. Pipe leaks can also result from wear and tear or the buildup of corrosion in the pipes. Accidental punctures by tree roots may also cause drain pipe leaks that jeopardize your plumbing system. Whatever the cause of your pipe leaks, the result is higher water bills and the potential for even costlier structural damage to your home or business. Adding insult to injury, the damages caused by water leaks may not be covered by your homeowners or commercial insurance company. 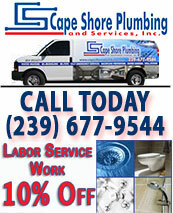 Don’t wait to call a plumber when you suspect water leaks or other pipe leaks. 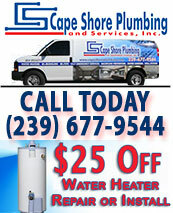 Immediately call the rapid response team at Cape Shore Plumbing, (239) 677-9544, and let us help you to stop those water leaks, and avoid structural damage from continuing to occur on property by calling . Our expert technicians will help you achieve peace of mind by leaving your property free from water leaks, guarant.